It seems almost hollow to begin this paper with facts. Empirical evidence that something is terribly wrong with our world today, as though facts were not argument enough. So what if half the people on earth must make do with two dollars a day? So what if the gap between the richest and the poorest continues do widen as we speak? So what if seven million children die each year because of debt repayments? Shouldn’t debts be honored? The numbers are drummed in, but somehow, people are unmoved. What do these figures mean to us? Perhaps if we today were living in New York or London, these figures would mean little. Here, in this city, one need only look outside one’s window, walk a few meters from one’s house, and see that something is wrong. In this city, in the middle of a third world country, these figures matter. Included in the seven million are some 1.5 million Filipino children , and it does not stretch the imagination to picture all those people living in shanties across the metropolis as numbering among the three billion. When something is staring you in the eye, you cannot blink and pretend not to see. Why $200 billion, the estimate I read in the paper the other day, would be spent bombing suspected "terrorists" into smithereens, when the same amount could be spent on something that wouldn’t involve killing and needless waste. It is the height of irrationality. Of course, one might say, it is their $200 billion to spend, to do with as they please. They could dig a pit, throw all the greenbacks in, light it up and have themselves a merry little bonfire, and its still their money. And our problems are still ours. Those street children out in Manila’s thoroughfares are our street children. One could say, so what if Sub-Saharan Africa will have 71 million less people, having died of AIDS, by 2010 ? It is their epidemic to deal with. It will certainly end their suffering. It is this way of thinking, this perception one, like you or me, might come across in our pursuit of truths. In the era of so-called globalization, the world’s ills are probably not among those that go global. Things such as hunger, famine, illnesses, destitution, and ignorance do not travel the earth in, say, a click of a mouse unlike huge amounts of money. Clearly, we are not living in a global village with one tribe if half the population struggles to make life livable and the other much more affluent half looks on with blank faces. Hardly anybody speaks of dependency or underdevelopment today. The catchphrase these days is liberalization and globalization, as though these two always come in tandem. Liberalize to globalize, globalize to develop, and so we are led to believe. And yet it has not been so glaringly evident that there is a need to talk about dependency. It is the modest aim of this paper to show that conditions of dependency continue to exist (it has never gone away), that the vagaries of those in power continue to be exercised over those who are not, through the instrument of debt. Third World Debt, in a span of a decade, has not decreased even though debtor countries, like the Philippines, have painstakingly ‘serviced’ their debts. Anyway, they have not had a choice in the matter. External debt in 1982 stood at $745.1 billion. In 1992 it doubled at $1,520 billion (Chew & Denemark, 1996: 120). In 1997, it stood at over $2,000 billion. One need not be an mathematician to detect a trend. If only the Organization of Petroleum Exporting Countries hadn’t raised oil prices, then the magnitude of debt would not have been aggravated. What prompted the OPEC, already in existence since 1960, to clamor for a increase in oil prices thirteen years later? Raffer offers one explanation. ‘Big Oil’ and the US Administration “became interested in higher oil prices (Raffer, 1987: 159).” Why? For one, the major oil companies drilling for oil were American (Exxon, Mobil, Texaco). These companies were headquartered in Saudi Arabia, the largest oil producer and owner of ¼ of the world’s known oil reserves. If they decided they wanted more profits…then they acquired more profits. See, the logic is fairly simple. Clearly, the Oil Industry continues to enjoy considerable influence over the US government, as can be demonstrated from recent events. “The effects of the oil price increase would give the USA competitive advantage vis-à-vis Europe and Japan (Raffer, 1987: 162).” In short, the oil price hike was instigated by the US, and the OPEC took the fall as the culprit. Was 1982 dated as the onset of the Debt Crisis because Mexico, one of the largest debtors, declared it could not pay its debts? Was it because the Mexican $85 billion liability included loans that “accounted for significant percentage of the capital of the largest US banks,” (Spero & Hart, 1997: 188). The policies pursued from 1982-1984 were mainly austerity programs; “spending restraint, reduced subsidies and higher taxes (Spero & Hart, 1997: 190).” A second strategy called for structural changes in the debtor economies, ostensibly, to make their economies much more efficient, making more money and being better able to pay debt. This was the beginning of the language of liberalization. Trade and finance liberalization meant reduction of tariffs and greater access for foreign direct investment. Deregulation meant reducing subsidies, interest rate controls and exchange rate regulations. Privatization meant selling state-owned industries (Spero & Hart, 1997: 193). Effects of these structural adjustment programs will not be discussed in this paper. Suffice it to say that whatever intervention the national governments could impose on ameliorating living conditions within their territories had to be ‘voluntarily’ ceded to meet with the international creditor’s demands. Whatever illusions of sovereignty were relinquished and certainly, whatever calls for development, for greater equity, for redistribution of wealth had come to an end. “By the end of the 1980’s the only development policy that was officially approved was not to have one… (Leys, 1996: 24)” Leave it to the market to allocate resources, not the State. …the specific policies of the IMF are designed to ensure that the burden of adjustment is placed onto non-elite classes. This is not merely because of the economic framework of the IMF but because securing the cooperation of local elites for the implementation of IMF programs involves sparing them the costs of adjustment (Passe-Smith, Goddard & Conklin, 1996: 255). Today over 50 countries are in debt, 40 of which the IMF calls ‘heavily indebted poor countries.’ The IMF harbors an illusion that this debt will, some day, be repayed. 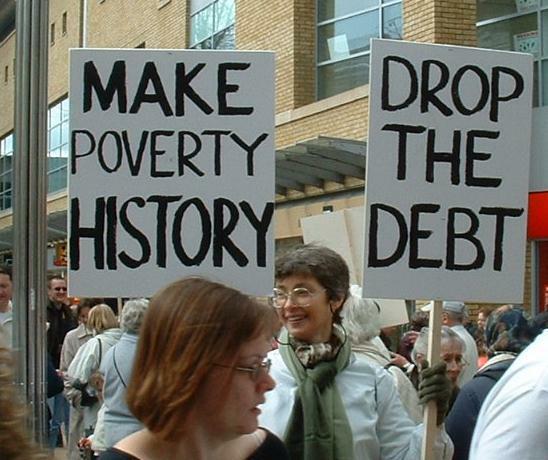 Debt cancellation, according to them, is not the solution for an overall strategy to fight poverty. HIPCs and many other poor countries will rely on external financing for their development needs long into the future. A growing portion of this need is being met by bilateral and multilateral agencies on concessional terms. Total cancellation could imperil these funds. Twenty years after the onset of the crisis, the solution doesn’t seem forthcoming. Probably not in the next hundred years. Who knows? Unequal exchange persists. Instruments of trade such as the WTO are battlegrounds littered with dead Third World good intentions and hopes. It looks like debt continues to be another mechanism where the rich not only exercise control over the poor, but actually make a killing form them. Dependency speaks to those of us who have removed our blinders. Through the heavily tinted windows of six-figure imported modes of transportation our policy makers and leaders seem to prefer, it is quite easy to divorce oneself from the reality on the other side of the tinted view. Between the incremental, sometimes drastic increase in prices of petroleum products, everything sold in supermarkets and public markets, everything sold in malls and department stores, everything sold on sidewalks; the minimum wage still pegged at P250 since God knows when; the devaluation of the peso from P27 five years ago to P52 today, the ‘highly abstract’ notion of a core and periphery, the language of dependency, is not difficult to comprehend. Dependency theory, with its notion of a world economy that creates wealth for a few and deprives many more, speaks to me quite simply. The evidence continues to unfold before my open eyes. 29 July 2005, 1:00-4:00 p.m. The Agreement on Agriculture (AoA) is one of the most contested and criticized accord under the Multilateral Agreements on Trade in Goods subsumed in the GATT-UR Treaty. Although agriculture has always been covered by the GATT, GATT 1947 allowed countries to use export subsidies on agricultural primary products, which resulted in the proliferation of barriers to agricultural trade, including by means of import bans, quotas setting the maximum level of imports, minimum import prices, non-tariff measures maintained by state trading enterprises, etc. The AoA was, therefore, intended to amend this flaw in the old GATT in order to establish a fair and market-oriented agricultural trading system, as the agreement would improve predictability and security for importing and exporting countries alike. The AoA hinges on increased market access through tariffication of all goods, the reduction of existing tariffs, and imposition of tariff rate quotas; reduction of government subsidies to producers considered as domestic support; and substantial decrease in export subsidy that comes in the forms of total budgetary outlays and the total quantity of export covered by government support. These trade mechanisms are identified to create an environment conducive to borderless exchange of agricultural products. 1. The GATT AoA initiates the worldwide process of putting agriculture within the discipline and rules of a multilateral agreement. 2. Built-in adjustment assistance mechanisms as well as measures against unfair trade and import surges are provided for in the treaty in order to minimize dislocation costs in agriculture. 3. Tariff barriers on agricultural products will be lowered in the developed world creating new market access opportunities for existing and emerging agricultural exports of the country. 4. Competitive enhancing measures will continue to be allowed under the AoA, which if implemented by the Philippines will enable the country’s farmers to maximize the benefits they can obtain under the GATT treaty. 1. How much of the commitments, pertaining to the AoA, have been implemented by the Philippine government? 2. How much of the promised benefits of WTO accession to Philippine agriculture materialized? a. What were the actual gains and losses to Philippine agriculture? b. What were the factors that may have contributed to this situation? 3. What has been the negotiating position of the Philippine government in agriculture since the treaty entered into force up to the WTO ministerial conference in Cancun? 4. What policies should be crafted, strengthened or repealed, in light of Philippine agriculture’s 10-year performance under the WTO-AoA regime? How long has it been? A few days shy of two years now. I wonder how you are, where you are, what you're doing. I wonder if you think of us at all. Here. When you were with us, right there at the very end, I could only think of how so much simpler things would be without you. With the bravado of youth, I imagined life would be less complicated and pain-free if you were no longer around. I did. And just like that, my most secret wish, which laid low in my subconcious, came true. Problems solved. Now, I no longer see in black and white. I'd always thought I wanted to be more like Mama. Spunky and ambitious and full of dreams. But I knew, in me, I also had you. I suppose all children realize their differences and similarities with their parents, I thought, I could have the best of both of you. I probably do. I credited you for so little because you were always quiet and laid-back and hardly said much in my presence. Mama was always the beautiful peacock, the face of the family, the proud matriarch. You were content in the shadows, beaming with pride for your dashing wife. Always the center of attention she was, naturally charming and full of life. I credited you for so little when you did so much. You were her voice of reason, her balance, her anchor. When she was dreaming up beautiful pictures, you brought her back to reality. You truly were partners, two halves of one. I know that now. And how painfully so. Were you remiss for being a father? Maybe so. If fathers were always affectionate and generous and encouraging. You were not. But you were other things. You were solid and present and sober. You were kind. You were humble. Now, I wonder what life would be like if you were still alive. If you hadn't driven that car, didn't have a few drinks that night. I imagine, you would still be Mama's voice of reason and caution. Seeing darkness, when she only sees light. Seeing bad, when she only sees good. Her guide. Her link to the ground when she is always poised for flight. I miss you Papa. If only because I know she needs you. Now, I must be you. I must play protector and guide. Her anchor to earth. The 1st Cinemalaya Independent Film Festival 2005 is a joint endeavor of the Cultural Center of the Philippines, the Film Development Council of the Philippines and the University of the Philippines Film Institute. Scheduled to screen at UP Film Center this week, July 18-23 are the following full-length feature films. The purity of first love is pitted against the squalor and corruption found in the slums of Manila, the setting for Ang Pagdadalaga ni Maximo Oliveros (The Blossoming of Maximo Oliveros). Gay, pre-teen Maxi is slavishly and uncomplainingly devoted to his family of small-time criminals. He cleans house for them, cooks for them, washes their underwear, mends their tattered jeans, and, if push comes to shove, covers their tracks for them so they wouldn't get caught. His world revolves around them. That is, until he meets Victor, a principled, idealistic and handsome policeman. Maxi befriends Victor, who, in inspiring the boy to hope for a better life, earns the ire of Maxi's family. A sleepy village is turned upside down by a videoke machine. This light-hearted tragicomedy focuses on four characters whose feelings are long repressed by their individual condition, and like many people in the barrio, find singing in the videoke the sole expression of their sentiments in life: Lea, a 14-year old orphan who works as a maid in the nearest town and is forced to swallow the daily humiliation from her employer; Perla, a bored and sexually stagnate wife who always attempts to leave her husband but never had the courage to do so; Joan, a young prostitute outcast in the verge of exposing the village preacher as her most ardent client; and Digna, a public school teacher who became catatonic as a result of the death of her husband and children. When the barangay captain Ka Munding, holds a videoke contest, the four women competed in the finals. Singing on the videoke slowly awakens their self-worth an awakening that leads them to confront their repression and overcoming them. Big Time follows the misadventures of two small-time criminals, Danny and Jonas. When they attempt to move into the big time, a series of unforeseen events soon draw them in way over their heads. What starts as a simple kidnapping soon develops into three days of fun, games, and death. Big Time is the story of a felony gone horribly, horribly awry. Fun for the entire family! This movie dwells on the effects of technology to people, specifically, the Filipino people. In a world wherein modern technology serves as the driving mechanism of people's lives, the story attempts to show that people's needs and wants remain the same despite the many technological changes bombarding their daily lives. One of the main characters is J, who works as a snatcher and as a small time pickpocket. Everything turns out to be worse than it used to when J steals the cellphone of Sam (an ex-cop who now works for a drug syndicate). J got himself into trouble by meddling in an activity involving drugs, which was supposed to be carried out by Sam. Sam was able to track J down and in order to survive together they struggled to run from Sam's drug syndicate which is out to kill both of them. The story ends in a hopeful note, with the two characters hoping that life would get better if eventually, they learn to play with life's tricks and trades. The film shows that despite the technological changes we are facing, one thing remains constant: our weakness for material things. The patriarch, Joseph, an alcoholic and gambler played by Eddie Garcia is rushed to the Intensive Care Unit. His daughters Cely (Irma Adlawan) and Beth (Angel Aquino) are torn between ending or prolonging his life by making the necessary medical interventions. The whole family is in crisis. At the same time, both Cely and Beth have to cope with their husbands and children. Laponggols is a black comedy film which focuses on two film workers, Raffy, the clapper, and Dido, a utility boy. Both share the same dream: to direct their own films someday. Their lives as mere "small production people" took a different turn when, together with the people in the unit van they were riding, had an encounter with armed men. Their co-workers were killed, and the two of them were forced to drive the unit van out of fear until it ran out of gas. The van contains equipment for movie production like cameras, lights and film stocks. They ended up in a secluded barrio not yet reached by modern technology, and therefore, the townsfolk knew nothing of the movie industry. The two pretended to be famous yet unrecognized directors, Erik Matti and John Red and told the people that they were looking for actors for the movie they are going to shoot. This news made the barrio people over-enthusiastic until everyone - from the village idiot to the village head - forced their way to be included in the supposed "film." The barrio suddenly became a "microcosm" of the film industry. PEPOT ARTISTA by: Clodualdo del Mundo Jr.
Pepot Artista ia a comedy-musical that focuses on a ten-year-old boy whose dream is to become a movie star. Pepot, the dreamer, is surrounded by people who are equally dazzled by the movie world. The film explores the penchant of Pinoys for entertainment in the midst of serious social problems. Luis Manalansan Jr works as a motel room boy who finds out one day that the boarding house where he is renting a room is about to be demolished. This sends him hunting for a new place to live with the help of Melba, a prostitute who is a regular client at the motel. Lonely and vulnerable, Luis starts falling for Melba. But giving in to his emotions means abandoning his wife, Mercy, who is recuperating from a mental relapse inside a mental institution. Torn between his newfound love and his marital vows, Luis turns his room hunting into an emotional journey that leads him to his ultimate dwelling place. Sarong Banggi, as the Bicol song of the same title suggests, takes place in the span of one night. It opens with a barkada teenage boys in search of carnal pleasure. As they go their separate ways with their respective partners for the night, one of them goes in a different direction. He strikes up a conversation with an older woman, and as the night grows deeper, so does their new relationship. What starts out casually turns intimate and surprisingly tender. In this unusual one nightstand the teenage boy loses his virginity and the more experienced, toughened woman rediscovers her vulnerability. For Cinemalya winners, click here. Why should foreign language learning be of value in the first place? It is often argued that now more than ever, ours is a globalizing world marked by open, porous borders. This phenomenon of political, economic, cultural and social interconnectivity is often linked to the presence of multinationals in the country. Why study a foreign language? In order to gain employment in a multinational company, and ultimately, earn a better living than might be provided for by local industries. Or, in order to migrate abroad and, ultimately, earn a better living than might be provided for by the country. Knowledge of a third language other than Filipino and English is added value, a competitive advantage in today’s cutthroat domestic and international labor market. While this argument is practical and sound, it is our view that attending an institution of higher learning goes beyond mere calculation of returns. A university education should mean more than considerations of just how dear a graduate might render her services to the highest bidder. Each word, turn of phrase and even syntax are embedded with ideas and ideals. Knowledge of a foreign language opens one’s mind to other ways of life and other ways of thinking. Languages ultimately heighten our common humanity. It opens a person’s perspective beyond her immediate surrounding and ultimately, beyond her immediate concerns. Languages broaden one’s horizon to encompass great, big ideas much larger, and more meaningful than our own humble existence. Is this not what being an individual for others ultimately means? Knowledge of other cultures may inevitably lead to comparisons with one’s own. The Filipino's “love of country” has always been suspect, and one cannot help but assume that in this comparison, our own culture may always come up short. It may even be argued by certain Nationalist perspectives that appreciation of things foreign erodes our own appreciation of Filipino culture. Here we argue that this argument is misplaced. Many crimes against humanity have been committed in the name of Nationalism. What is “national” is considered sacred, inviolable and must be protected from the “external.” But a simple division of the world into neat and independent territories no longer applies. Now more than ever, it is increasingly evident that nations are interdependent and reliant on one another. For example, the actions and decisions of the world’s more influential countries impact on all us. Conflicts from far-flung places inevitably spill into domestic discourse. Goods, labor and policies as well as cultures, norms and ideas now freely circumnavigate the globe. Perhaps, to be nationalist is to put “love of country” in proper context. And the context is that of a multi-ethnic and religious developing country ensconced within a globalizing world of both perils and opportunities. To sum up, languages open as well as close doors. Languages can connect as well as exclude. In the larger context within which we live today, it is perhaps wiser and more prudent to open and connect rather than to close and exclude. My friend Luis has gone absolutely berserk and published an online free version of the latest Harry Potter book. While I myself am not a fan, go ahead and enjoy! For people who want to see Sa aking Pagkagising Mula sa Kamulatan, you can catch it today, July 16 at the Tanghalang Huseng Batute of the CCP at 1:30 pm. A Tarantinoesque (as in Reservoir Dogs) crime caper, the film follows a simple errand of the two curly-haired protagonists Conrad (played by Epi Quizon) and Andrew (Boy2 Quizon). From his hospital bed, Condrad and Andrew's mysteriously forbidding Uncle Tom (Mark Gil) asks them to deliver a package to an abandoned hotel. While the opening hospital scenes seem unecessary, the real action begins when the two reach Hotel Maricopa. There they meet warring criminal factions played by Eddie Garcia and Jaime Fabregas. Will they be able to deliver the package safely? Is there payment in return? Will they make it out of the hotel in one piece? This film really isn't focused on the story/narrative. It focuses on the ideas going on in the heads of Conrad and Andrew, both film enthusiasts and wannabe filmmakers. As such there are plenty of references and lines from local as well as Hollywood flicks and industry inside jokes. Any movie fan will appreciate writer-director Peque Gallaga's hommage to Pinoy pop-culture; a mix of Pinoy and foreign influences. In his constant referals to Lino Brocka and Ishmael Bernal, one might detect a certain nostalgia for the past, when Filipino cinema was cinema. However this film also acknowledges and accomodates changes in trends and Pinoy taste in movies. Obviously, Hollywood is here to stay, and we'll continue to be fed a steady staple of American flicks indefinitely. "Not your typical Pinoy film" is this movie's tagline. Indeed, its selling point. And it isn't. Typical I mean. But by no means is it brilliant, revolutionary (although it might pretend to) or even artistic (assuming it intends to be so). What it is is important. Especially these days when the Philippine movie industry is dead and dying some more. It is an important film because it breaks the monotony of formulaic output that we've been force-fed these past few decades. It is important because it preaches to the young, creative and eager minds of a new generation of aspiring filmmakers. It is important because it is smartly made and marketed; finished in two weeks and costing only a millions pesos. It is important because it wants to be so. 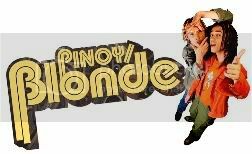 Go and see Pinoy/Blonde. Catch it at Galleria, Gateway or any of the SM Cinemas. You certainly won't see it in your usual "snooty" movie houses. You might appreciate it when you've a little "buzz" goin' on. Otherwise just bring plenty of popcorn, carbonated drinks and an open mind. Enjoy. Why The Issue Goes Beyond "Hello Garci?" I believe excerpts of this insightful book on Philippine political economy explains why merely changing Presidents is not enough, why the issue at hand goes beyond whether GMA is guilty of violating the constitution or whether she indeed made that call. It speaks of fundamental flaws in the social fabric of this country and why in times of crisis such as now, it should behoove us all to think beyond the "circus" unfolding before our eyes. Words in italics, bold or underline are my own. This, people, is the story of our lives. If you don’t understand certain terms, never mind, read on. When this book first began to take shape in 1989 and 1990, my primary goal was to explain the Philippines’ longstanding “developmental bog.” In contrast to its booming neighbors, the country was plagued by very low – an occasionally even negative – rates of economic growth. 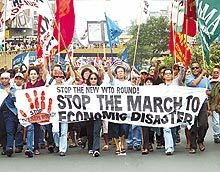 ...By almost any measure of economic growth, the country was in a quagmire; despite tremendous human and natural resources, the Philippine political economy displayed a particularly strong resistance to fundamental change. …a major source of obstacles to sustained development in the Philippines lies in the political sphere, and these obstacles are revealed through the careful examination of relations between the state and dominant economic interests. In other words, successful economic development has been constrained to a large extent by weaknesses of political development. …By all accounts, the Philippines should have al the ingredients necessary for developmental success: tremendous entrepreneurial talents, an enormously talented and well-educated workforce (readily conversant in the dominant language of international business), a rich endowment of natural resources, and a vibrant community of economists and development specialists. …The Philippines may seem to have everything going for it, but for most of the postwar period the country has been unable to go very far very fast. …The Philippines provides a clear-cut example of what kinds of obstacles to capitalist development can result when the power of an oligarchic private sector is never tamed, and there is no concerted effort to promote the development of the public sector. …the Philippines’ developmental quagmire can be traced in large degree to the endurance of a predatory oligarchy and a patrimonial state. Together, the distinctive features of state-oligarchy relations in the Philippines make up the system of booty capitalism. Throughout modern Philippine history, one finds far more oligarchy building than state building: the oligarchic families have had ample opportunities, historically, to consolidate their power with the support of external forces, while the state has remained woefully underdeveloped. As a result, the state apparatus continues to be easy prey to powerful oligarchic class that enjoys an independent economic base outside the state, yet depends upon particularistic access to the political machinery as the major avenue to private accumulation. …Faced with the myriad particularistic demands of powerful elite interests, the Philippine state has rarely displayed the capacity to formulate or implement a coherent policy of economic development. Indeed, the Philippines presents a stark example of a state that has failed to effect the kind of economic change found among the East Asian NICs…Unlike the Korean and Taiwanese states, which at certain crucial historical junctures enjoyed considerable autonomy from dominant economic interests, the Philippine state is so lacking in autonomy from dominant economic interests that even the most basic regulation of capital is continuously frustrated. …The limitations of the Philippine state apparatus, however, go far deeper. Not only is it incapable of replicating the kind of interventionist capacity of its East Asian neighbors, it is also incapable of providing the even more basic legal and administrative underpinnings necessary for “free-market” capitalism. In the Philippines, the major issue is not the virtues or demerits of capable state interventions in the economy…the major issue is the capacity of e state to carry out even the most minimally defined functions. …Within booty capitalism, a group with an economic base outside the state is plundering the state for particularistic resources. There is, in fact, a certain social mobility at the helm of Philippine society, as new families appear out of nowhere and some of the old families fall by the wayside. …As new faces gain favorable access to the state apparatus, they too can achieve big-time success in Philippine business. We find in the Philippines not a fixed aristocracy, but rather a social group that is based on wealth and that changes over time. As in the past 2 1/2 EDSAs, today we are witnessing what could potentially be a mere change of faces, a mere change of elites (whether they be old rich, new rich, artistas, sons of artistas, journalists, trapos or basketball players) and a continuing wretched cycle of a State unable to free itself from the choke-hold of only a few with the power and means to do so. In the mean time, ordinary folk, you and I, must deal with, and largely on our own, sky-rocketing oil-prices, deficient (indeed non-existent) public services, and a government that is concerned with so many things other than governance. Aren't you sick and tired of it? I am. Typical of many UP gatherings of this kind, the opening remarks of the forum were greeted by boisterous calls ringing from outside the Faculty Center. I could only make out “Patalsikin si Gloria” and “Walk out! Walk out!” from the campus’ more militant youth organizations. The speakers present were Congressman Joey Salceda speaking for the Arroyo administration, Joel Rocamora of the Institute for Popular Democracy speaking from the more progressive sector of Civil Society, Sanlakas national president Wilson Fortaleza from the more radical sector of Civil Society and College of Law professor Marvic Leonen. Reactors present were UP Professors Teresa E. Tadem and Serena Diokno. I do not envy Representative Salceda for having to come to UP, a know bastion for “radicalism,” in defense of the current administration. I do laud him for having tried his best to make GMA’s “offenses” forgivable. In an eloquent, articulate manner, he does not deny that there is cheating in elections. However, he vehemently denies that GMA called that certain Comelec Commissioner to change the result of the elections. Here is how he makes his case. This wider context has made GMA widely unpopular for the impacts all Filipinos must suffer. This compounds the President’s current predicament. The Congressman then says that while Cheating may have occurred in the 2004 elections, “it did not dictate the election outcome.” He then says that GMA made the calls to that Commissioner in order to assure that the Election Returns (ER) match with the COCs (Certificates of Canvass) then being tallied by the House of Representatives. He says that the issue is not about Cheating but about an Improper Conversation. By Reform, Salceda proposes we give GMA a 6-month probationary period to get her act together. He proposes a constitutional convention and a fact-finding commission. Mr. Rocamora of the IPD speaks with the demeanor of one who has long been engaged in the struggle for social change. He speaks with calm, measured tones of one whose optimistic will battles with his pessimistic intellect. He makes his case as follows. While GMA’s public apology may appease certain sectors of society, we must apply higher, more stringent standards of proper conduct from the President of the land. She is after all, the single most powerful individual whose decisions affect us all. A simple “sorry” is unacceptable. He continues, the cabinet members who resigned this morning are linked to the segments of Philippine Society who brought us EDSA 1 and 2. These people are the administration’s economic managers: the Finance Secretary, the Budget Secretary, the Trade Secretary, the Commissioners of the BIR and Customs. After their press conference they then proceeded to the Heritage Library in Makati. This, he says, may be interpreted as the tacit agreement of the Makati Business Club. On our international credit ratings, we can’t afford the 6-month probationary period proposed by Congressman Salcedo because surely, our ratings will fall. On Mrs. Aquino, Rocamora says she has been tasked to “neutralize that other widow – Susan Roces.” On the military, while the Police Generals from Crame has shown their loyalty to the President (as can be publicly seen on the Inquirer’s front page today), Camp Aguinaldo and the Armed Forces are an uncertain element. General Abat himself has proposed a military junta. Lastly, Mr. Rocamora calls for a unification of Civil Society groups organized in UP and Ateneo (Kompil). If these two groups come together, they can inspire ordinary people to work for change of the system. The transitional revolutionary government will hopefully lead to a change from elite rule to a true democracy, he says. The greater problem goes beyond the issue of GMA’s supposed cheating. More importantly, the good professor points out that people should not be afraid of the term “revolutionary.” When one hears the term one probably has mental images of angry red flags and burning effigies. Revolutionary was Cory Aquino’s provisionary government until the 1986 Constitution was finished. There is no reason to be afraid, she says. In an erudite and lucid manner that somewhat restores my respect for lawyers, the Law Professor states “Constitutional” does not just mean Impeachment. That is only one interpretation. While Marcos’ declaration of Martial Law was challenged, it was ultimately adjudged “constitutional.” The 1986 revolution and radical change of government were deemed “constitutional.” Erap’s ouster in 2001 (even when he did not resign) and his replacement with GMA were also deemed constitutional by the highest court of the land. In short, the present constitution is “flexible” in that it can accommodate an array of possible legal and constitutional measures. On the question of whether the President has broken the law, Professor Leonen asserts that by merely calling a junior official of the constitutionally-mandated independent Comelec, GMA has breached the constitution. 2. Betrayal of public trust. 4. Graft and Corruption – persuading another official to do something contrary to law. Lastly, Professor Leonen states that radical changes can also be constitutional. The constitution itself contains a radical element; you cannot check whether the new constitution coincides with the old one. Only in having genuine structural changes can we have a genuine democracy unlike the American model. Joel Rocamora: There are two questions we must answer. 1. What system should we change? 2. Who will lead this change? 1. Change of the political system to even the playing field, allowing for many other sectors to participate in government. 2. Anti-elite, a change in the balance of power in and among the many different classes. In answer to his second question posed above, Rocamora says the “WHO” will be determined by the political and social struggle in the coming weeks. It has taken me a long time to write anything about the Jueteng and Garci tapes fiasco. Perhaps suffering symptoms of People Power fatigue as many other members of the “middle class” (and I hesitate to use this term because whether an actual MC exists in the Philippines is debatable), I waited for more proof and more palatable options. Unlike 2001 where there seemed to be a tangible dragon to slay, today, enemies seem to come from all directions. As my mood has been since the start of this year, I was deeply pessimistic of any outcome. A change in President does not assure a change in the system. It has happened twice before, and the results are the same. But who says we can't mount as many EDSAs as we want? Who says we can't oust as many Presidents as we want? The danger is in how the events of the coming days will unfold and Who will seize power. Noli? Loren? Erap? Susan? Abat? Lacson? Who says the WHO can't be us, ordinary people? The only key, and perhaps the most difficult to do is, to take action now and to be not afraid. 8 July 2005, Friday, 1:00-4:00 p.m.
1. What are the solutions to the current political crisis in the Philippines? 2. How will these be implemented? 3. How feasible are these solutions? 4. What is the short-term and long-term impact of the crisis and its supposed resolution to the country’s political institutions and economic conditions, and more importantly, to the people’s trust and confidence in the government necessary in achieving long-term development and stability? In addition, there are unresolved issues concerning the First Family’s involvement in the perpetual problem of jueteng payola. And with only four years since the last turmoil that the highest official of the land has created, public perplexity on the solution to this impasse, as well as on the future course of the nation, has reached its apogee. At present, a cacophony of voices is contributing to this confusion. As the political crisis begins to take its toll on the fragile economy and on the psyche and morale of the people, speculations on the next possible scenario now abound. If Filipinos are forgiving enough, as often stereotyped, then it would be “business as usual.” But with the mounting public outrage, the possibility of such is not forthcoming. On the other hand, despite the President’s statement, there is cynicism on the prospect for the constitutional track, mainly through impeachment. With only a handful of minority congressmen in the House of Representatives, the impeachment complaint could be easily thwarted. Thus, the formation of an independent fact-finding commission that will look into the suspected electoral fraud and its implications is deemed desirable. Nonetheless, questions on the composition of the commission and the enforceability of its decision cast doubt on this option. In contrast, a large number of groups are fervent on addressing the problem through a complete overhaul of the system, not merely through a change in leadership; hence the proposal of a revolutionary transition government. But for now, the type of revolutionary government remains up in the air. With alternatives still uncertain, the crisis could drag on, to the detriment of the people. 3. Provide the academic community an opportunity to make intelligent judgment of the present state of affairs. My boyfriend (who was visiting over the weekend) and I were on a leisurely Sunday drive on EDSA yesterday morning when we spied a thick plume of smoke approaching SM North. "Is that a building on fire?" "Yeah, its on the backseat. In the blue pouch!" "No, the other blue pouch! It's a freakin' SUV on fire! Hurry!" He turned on the digicam which quickly conked out. I kept my eyes half on the road and half on the middle console in a mad scramble for spare batteries. We were so close to the burning vehicle we were enveloped in thick dark smoke and the heat of the flames. "Theres not enough energy in the batteries to keep it on!" "I know!!!! O crap! It just keeps conking out!" He then whipped out his phone which we both forgot had a camera conveniently installed. Here are the photos we took of the burning Nissan Patrol in front of SM Annex at approximately 10:30 in the morning. We were there even before the police, fire fighters, the MMDA or media crews. Scanning the news this morning I found out this was no accident but an actual bomb blast. Read the news item here.